Warning and alerting techniques protect employees from hazards that cannot reasonably be eliminated or satisfactorily reduced by design, engineered safeguards, or a combination of these elements. "Wallace, if we lock out this machine every time we have a pill jam, we will never make any product!" This was the testy response I received from a production manager while performing a lockout audit at a pharmaceutical plant. With the exception of minor tool changes and adjustments and other minor servicing activities, employees are typically prohibited from placing any part of their body into the point of operation while a piece of equipment is energized. But what about the following scenarios? An employee is required to jam clear a machine several times each day, and locking out the machine would drop product onto the floor. Performing lockout/tagout to change the tape roll inside a box machine would result in loss of data to the programmable logic controller (plc). Programming a robot must be done inside the robot cell while the robot remains energized. The preceding scenarios illustrate the need for performing a lockout/tagout risk assessment. 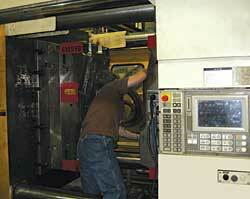 An example of an employee entering the die press area to remove a finished part from a plastic injection molding unit is shown in the photograph below. The current edition of ANSI/ASSE Z244.1--2003: Control of Hazardous Energy-- Lockout/Tagout and Alternative Methods addresses the use of alternative methods for lockout/tagout. Section 5.4 (Alternative Methods) states that whenever lockout/tagout is not used for tasks that are routine, repetitive, and integral to the production process (e.g., tasks that are short in duration; relatively minor in duration; occur frequently during the shift, day, or week; are usually performed by operators, set-up, service, or maintenance personnel; do not involve extensive disassembly; represent predetermined cyclical activities; are expected to occur regularly; minimally interrupt the production process; exist even when optimal operating levels are achieved; require task-specific personnel training), or traditional lockout/tagout prohibits the completion of those tasks, an alternative method of control shall be used. Selection of an alternative method shall be based upon a qualitative risk assessment of the associated machine, equipment, or process and shall take into consideration that existing safeguards provided with the machine, equipment, or process may need to be removed or modified to perform a given task. ANSI/ASSE Z244.1 does not prescribe a specific methodology for performing the risk assessment. Annex A, however, provides guidance. 1. Identify all tasks: All tasks and activities should e considered, including set-up, installation, removal, maintenance, operating, adjusting, cleaning, troubleshooting, and programming. 2. Identify hazards: Hazards, such as electrical, gravity, mechanical, chemical, thermal, pneumatic, hydraulic, radiation, and human factors associated with each task, should be considered. 3. Assess potential consequences: Assess the most severe injury that could occur with each task. 4. Assess potential exposure to hazards: Evaluate the potential exposure of all persons to the identified hazards. 6. Evaluate the risk: Each identified hazard and task should be evaluated to determine the level of risk. This will determine whether the task is an acceptable risk. 7. Achieve an acceptable level of risk: If the level of risk is found to be acceptable, the process is complete. If the risk(s) is/are determined to be unacceptable, the risk reduction process should be implemented. 1. Risk reduction by design: Risk reduction may be achieved by implementing changes to eliminate hazards or reduce risk by substitution. 2. Risk reduction by use of engineered safeguards: This includes safeguards or safety devices utilized to protect employees from hazards that cannot be reasonably eliminated or reduced by design modification. Examples of engineered safeguards include guards (both fixed and interlocked), trapped key devices, and trip devices (light curtains, laser scanners, pressure mats, safety-rated switches, etc.). Examples of safety devices include emergency stop buttons, enabling or hold-to-run devices, etc. 3. Risk reduction by use of warning and alerting techniques: These techniques are utilized to protect employees from hazards that cannot reasonably be eliminated or satisfactorily reduced by design, engineered safeguards, or a combination of these elements. Examples include attendants, audible and visual signals, barricades, signs, and tags. 4. Risk reduction by use of administrative controls: Additional risk reduction may be achieved with safe work procedures, standard practices and checklists, and training. 5. Risk reduction by use of personal protective equipment (PPE): The use of PPE should be considered the last avenue of protection after the previous methods have been considered. Lockout/tagout provides the greatest level of protection and, whenever possible, should be utilized to protect employees from hazardous energy. In situations where tasks are routine, repetitive, and integral to the production process, a risk assessment should be performed. If the task performed poses an unacceptable risk, acceptable risk reduction methods should be implemented to reduce the risk to acceptable levels.